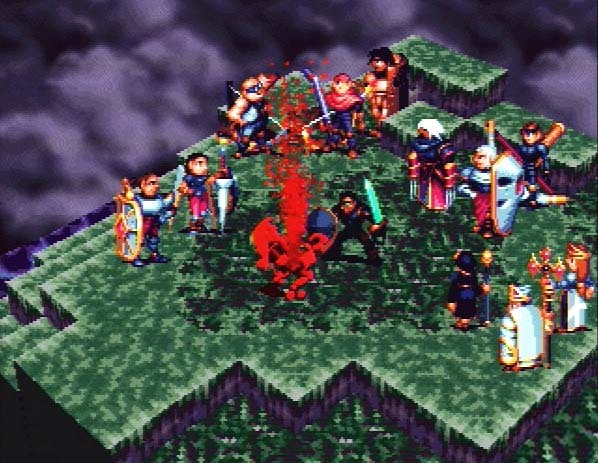 In 1997 SRPG developers were learning the ways of fully interactive 3D terrain. The Final Fantasy Tactics school lead by Matsuno chose to use the 3D terrain as just another element to be crafted into the whole system. They did it well. The topography and structures they incorporated added and enhanced the existing mechanics. Vandal Hearts operated in this latter approach as did Shining Force III and Kartia. In many ways Final Fantasy Tactics’ success propelled their way of thinking about 3D terrain to the forefront. Final Fantasy Tactics was a great game; the gold standard really. However part of commercial success beyond what an SRPG might expect to sell was because it carried the Final Fantasy name. In the wake of the Final Fantasy VII craze, that was no small thing. Fortunately the copious extra exposure was on a quality game that widened overall appreciation for the genre. Appreciation that in some ways helped establish a taste for SRPG’s in America. With that set up, Vandal Hearts had quality production values, a solid system of mechanics and interesting environmental interactions. It uses the conventional grid and angled down camera while teams move as a whole in turn based fashion. What? An RPG starts with a town being burned? Unheard of! VH had a smooth and smart active camera system. They also incorporated some interesting and effective focal length tricks. Camera is an important non-gameplay feature in terms of game annoyance factor. The best may make you smile, the good are not noticed, and the bad make you grit your teeth. 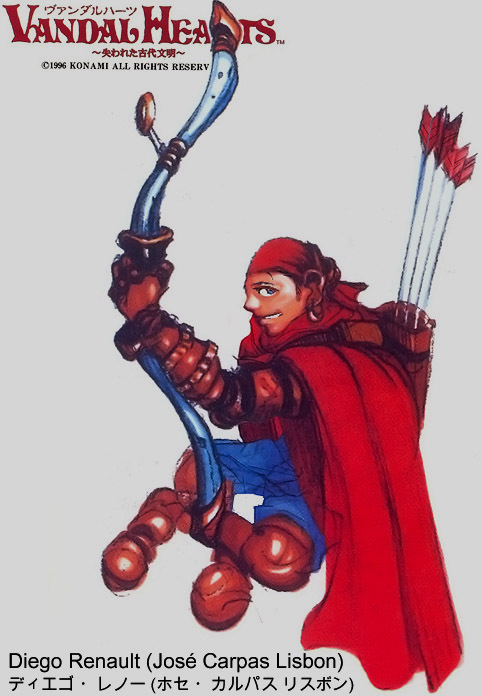 Archers were not treated as unwanted guests: They were a solid member of your team dealing out damage at range. They had their weaknesses to offset this of course. But all in all it balanced out. There are too many other games that do not handle such ranged attackers well. No Heimlich Maneuver Needed: Choke points were well conceived and executed. When combined with this game’s own brand of mechanics, they have rarely meant more in an SRPG. Their common use added greatly to this game’s challenging tactical fun. Developing them properly was time well spent. It is just these kinds of choke scenarios that thrusts the player into a battle for every grid square. Note to those new to the genre: Chances are a bridge in an SRPG is more than just a way across something. Flexible tactics: There was often two ways of dealing with a battle. Even when the key was set around a central choke, they often left a circuitous route available for those who really did not want to take the brute force approach. Supporting multiple play styles is a sign of system strength. No grinding. There was a set path and story to play through. Each battle meant something and gave enough experience for you to build your team. That sign up ahead? 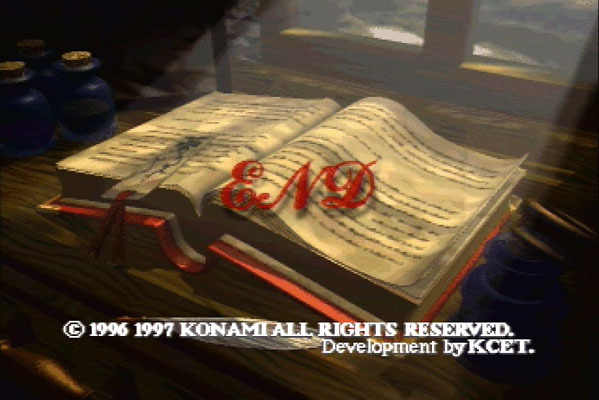 Chapters were introduced with nice looking animated title cards. Little touches like this can go a long way. Visual Effects Marching to Their Own Drum: Nicely done and a little different like many of the elements of this game. The buff VFX were pleasing, and the super magic attacks with swirling animated sprites emulating the forms of serpents and more were fun. Predetermined characters allow the story to be dramatically tailored around them. If a game employs predetermined rather than recruited characters, it needs to take full advantage. VH used them to move the story, dramatize the battles and provide cause to care. Character relationships evolved amongst the party members. Overall, excellent balance and challenge. Especially for those who play it like I do, trying to see that “everyone goes home”. The learning curve was not steep. In a genre where some games embrace unnecessary complication, VH kept it intuitive. 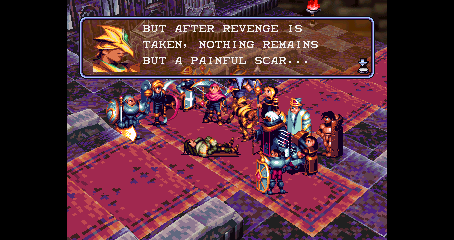 In game storytelling: Like Shining Force III, Vandal Hearts made sure you felt a reason to fight every battle. Each was set up with plenty of game engine cut scenes. Additionally there was dialogue interspersed during battles. In fact, one of your team members proposes to another in battle! How …romantic? Overall, a very good story telling experience. Truly words of wisdom. So then tell us wise guy, how do you see out of that helmet? 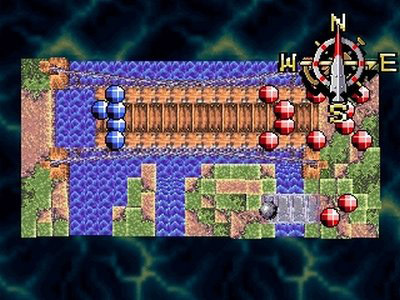 As mentioned in the introduction, few SRPG’s use dynamic environments during battles. Vandal Hearts does on occasion, like Shining Force III. The latter game put you into a battle in the middle of a train yard. The trains moved each turn changing the battle field and forcing you to continually reevaluate how to achieve your objectives. Vandal hearts also uses trains, but they put you on one. Your job is to fight your way up to the engine as the cars you move across get cut loose one by one. Another was set on a bridge as sections dropped away behind your party one by one. It forced you forward. There were boulders on a couple maps that could be pushed across the board onto enemies. One battle was set up with two ships maneuvering next to each other. They should have continued to use ship movements to add to the battle variables. They even included a boss that actually controlled the topography around him. He would raise it every turn making for different tactical decisions. A fun challenge. You were not just plopped down on a chunk of varying terrain and told to beat all the enemies. Some battle had more complex objectives backed up by environmental elements. For example you had to fight your way to a sluice-way switch. Activating that switch washed away all the enemies still within the channel. Other battles were set up as “ambushes”. Your team was secreted behind cover and you had to wait for the enemy to move within optimum range. Your lead hero gives you clues each turn, but you must make the decision. Too early and they will form up for an extremely tough battle. Too late and you will not be able to stop them from passing through. It was surprisingly dramatic. A pleasant surprise. After all the time spent with the characters, you are treated to a great narrative during the credit roll. Using additional artwork it depicts the character’s future. It is from the perspective of the main love interest girl, who is a little sad after the last battle. But thankfully, the story did not end there. I really like this “few years later” technique. It was also used well in Grandia. It is a great way of giving the player emotional catharsis. We like to find matching cosplay pics for our analyses. However none could be found for Vandal Hearts. 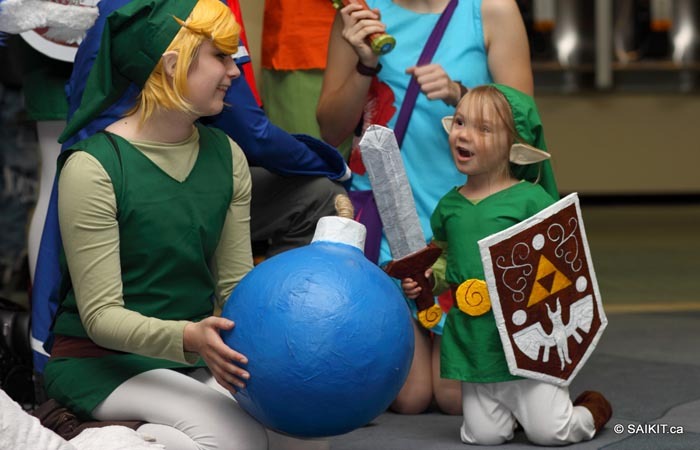 So instead here is a picture of the cutest Link ever. There was no going back once that bridge started falling away in sections. They made a very nifty top-down map mode for the battles. The camera flew high overhead and markers denoted the positions of both enemies and allies upon request. However, there was not really much call or need for it. We rarely used it and wonder where those development hours could have been better spent. There were a few very catchy music tracks, the rest were just okay. However, while there was plenty of music it felt as a player that there needed to be more. Limited character flexibility: Characters were stuck in their class with only a small number of specific exceptions. A few of the characters had a single branching level-up point. It was a little like Fire Emblem: Sacred Stones in this way. It was the price paid for a closely tailored story and ramping scheme. But it worked. The in-game portraits were, …well… some were a little ugly. The Art direction in general was less than pleasing to the eye. The colors were sometimes garish, clashing and/or hard to distinguish. 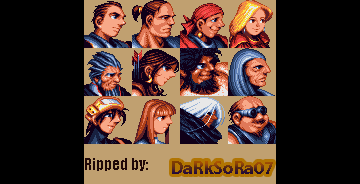 The character sprites were stylized but in a slightly misshapen way. Useless class: I had an archer I enjoyed using a lot. She fit my battle style. She had a branching promotion option. One of the two choices (unfortunately the one I picked) was a useless class that more or less turned her into a paper thin target. A real surprise demotion. Grrr. Another game world where enemies are actually composed of 120% pressurized blood! One of the drawbacks to “Turns by Team” is that the enemy can do an awful lot before you can respond. It is usually manageable with proper spacing and formation. In Vandal Hearts some enemy units had very long range. Occasionally a battle started with your placement in the middle of a mess, and it was hard to shield your weaker units from concentrated enemy fire. We understand why the AI is programmed with such behavior, and it made for a good challenge normally. However that behavior in the above circumstances only led to frustration as there was sometimes little or nothing you could do but watch the carnage on your party member(s). History chose the Final Fantasy Tactics school as the prominent one in regards to how SRPG’s handle 3D terrain. 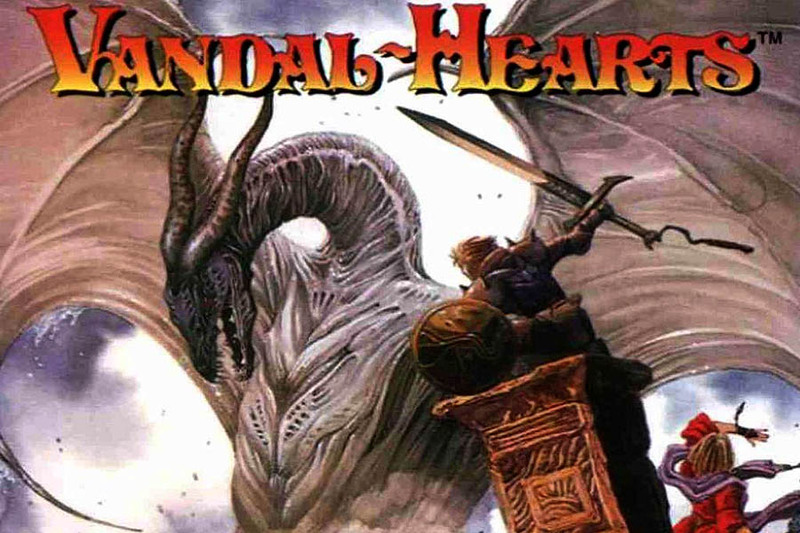 So when you have an opportunity to play a rare gem from the other school like Vandal Hearts, it should be embraced and enjoyed as a fun change up. 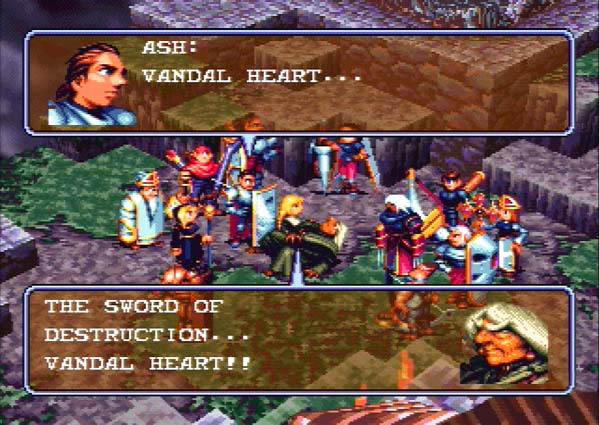 Vandal Hearts had a lot of passion, especially when compared to its more sterile and intellectual contemporaries. It also had a decidedly better ending. Its unusual flavor included a narrator with a strange “German-ish” accent that was hard to pinpoint. He said the craziest game words like, “Sostigaria!” in a different but entertaining way. Vandal Hearts is an accessible SRPG made with a decent budget. It is not that hard to find and is worth the effort to do so. See for yourself how the flute playing hero gets thrust through time, and how he and his companions struggle against overwhelming odds. Oh, and see if his star crossed romance has a chance against impossible odds. In 1997 SRPG developers were wresting with what to do with fully interactive 3D terrain. One side chose to use the 3D terrain as just another element to be crafted into the whole system. They did it well, and the topography and structures they incorporated into their existing mechanics added to their games. The other camp embraced the world of 3D more whole heartedly, putting less emphasis on some aspects of the deeper mechanics. Their vision of 3D terrain was to interact with it in gameplay significant ways using dynamic changes. 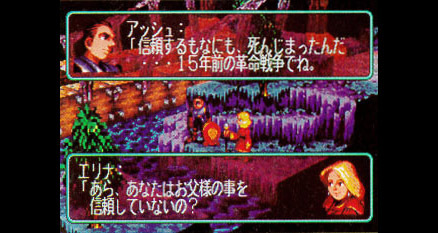 Vandal Hearts falls into the latter category as will Shining Force III and Kartia amongst others after it in 1998. Also debuting in 1998 was Final Fantasy Tactics which falls in the first category. 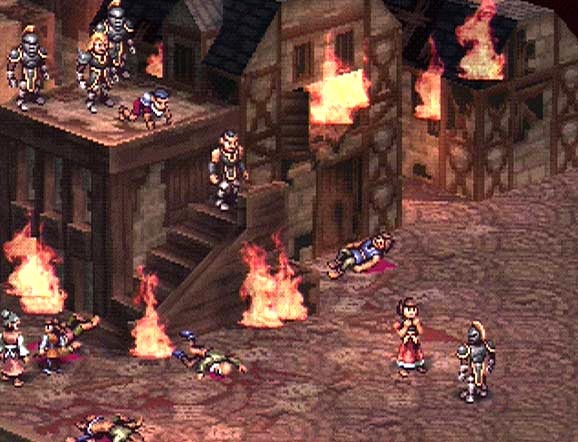 In many ways Final Fantasy Tactics’ success will propel their way of thinking about 3D terrain to the forefront. Final Fantasy Tactics is a great game; the gold standard really. However part of the reason why was that it carried the Final Fantasy name in the wake of the Final Fantasy VII craze. This is not to take away from the game’s awesome quality. It is just saying that their way got much, much more exposure than the others. With that set up I will say that Vandal hearts has quality production values, a solid system of mechanics, and interesting environmental interactions. It uses the conventional grid and angled down camera while teams move as a whole in turn based fashion. Well said cddb. We very much enjoyed this game and the quirky/unusual art direction did add to its unique charm——even if it was not our favorite. We think the appreciation for this well-crafted game would increase with more visibility. It would be a great addition to the PlayStation Network alongside Vandal Hearts: Flames of Judgment. Thanks for stopping by.